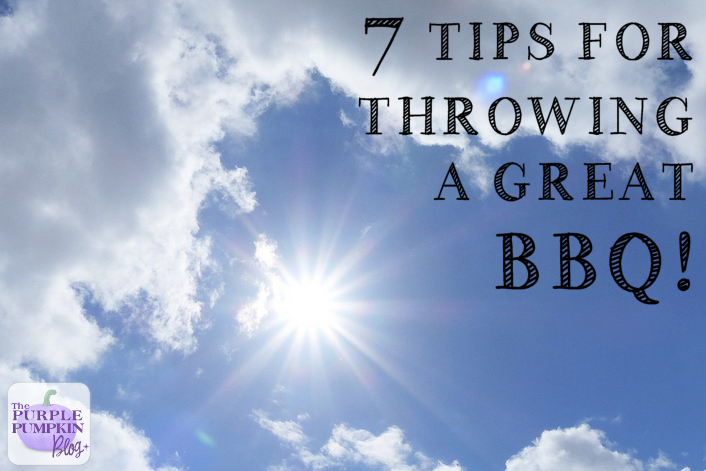 7 Tips For Throwing A Great BBQ! Call me bonkers to be thinking so far ahead as to summer, but with the (what seems to be) constant rain and miserable weather here in the UK, I can only but dream of the sunshine to keep me going! As I have grown older (cringe) I really dislike the winter, I’m sure that I suffer from a form of SAD as I seem to really struggle with things in the winter months, but come Spring, and certainly Summer I’ve perked up and feel more alive! After all of this rain that the UK has been lashed by, I do hope we’re in for a hot, sunny, gorgeous summer, because it means I can have the family round for lots of BBQs! To that end, when Homebase asked me to write about BBQs and eating outdoors, then who am I to say no? We just love having a barbecue round these parts, and if I could cook outside all summer long I probably would! In fact, we’ve had a barbecue as early as March and as late as the end of October! Now, of course, if you read my blog, you know that we are really looking forward to our summer hols in Florida, but what I haven’t yet written about is our plans for improving our home and garden! (I will get around to writing those posts!) In short, we’re hoping to put a conservatory in so that if the weather isn’t the best, we can still enjoy the garden, but I also have a plan to create a bit of a boho relaxation area at the bottom of the garden too. But that’s another post entirely! Ultimately, I hope that the garden is sorted to enjoy some lovely al fresco dining with the fam – and if it isn’t, we’ll still have a good time! But for now, back to BBQS! I’ve shared lots of barbecue recipes over the years as well as salads, sides, dips and desserts, and I always hope that you’ll find a recipe (or even recipes!) that you’d like to try out at home. I’ve also rounded up some of the barbecue parties we’ve had, to show different recipes all together, as well as my family life. I threw a Budget BBQ once, spending just under a tenner! I even organised a Vegetarian BBQ to show that you don’t have to be a carnivore to enjoy barbecue season!! We’ve got a couple of charcoal barbecues. We prefer coals over gas, but whichever you have, dig it out of the shed (or from under the cover) and give it a good clean. Over the winter months it will have gotten dusty and probably a bit minging, so always worth to give it the once over before cooking on the grills. There’s no way you’re cooking outside without the fire created by either coals or gas, so make sure you go and buy some. I know that there have been times when we’ve planned a barbecue thinking that we’ve got coals in the shed, only to find that no we don’t and it’s a quick rush to shops to buy some! Around the busy season, especially on the weekend if the sun suddenly shines through the country, you may find that you can’t even be able to get coals because they’ve all sold out!! So if you plan on having a few barbecues over the season, it’s worth stocking up – plus they do last, so they’re unlikely to go to waste. When I plan a barbecue – and if you’re a regular reader my blog you know that I love to plan a party or get together! – I make sure that the menu has something that everyone will enjoy. Sometimes I’ll have a bit of a theme for the food, for example, I once threw a Moroccan themed barbecue, it’s always fun to put a twist to a regular old BBQ! If you are making things like burgers and kebabs, it’s a good idea to get these made and in the fridge so that you don’t have to worry about rushing to get things done. Sometimes meat needs to be marinated, and time is needed for that marinade to work. 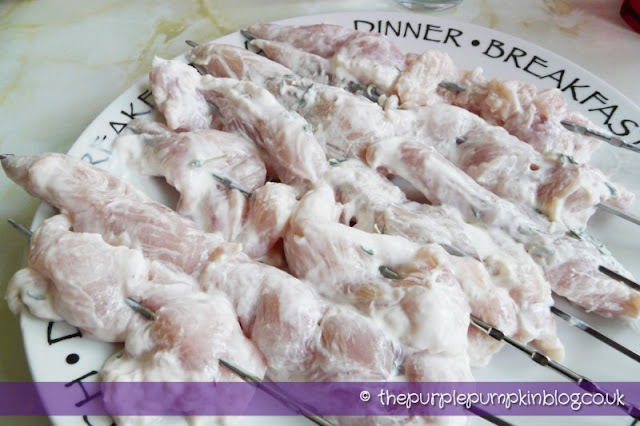 For example, I coat chicken kebabs with natural yoghurt and seasonings to give it more flavour, and like to do this a few hours before we are ready to grill. I don’t really cook meat with the bone in, on the grill, like chicken legs/wings, but if I do, I cook them off in advance in the oven and finish them with a blast of fire from the barbecue. Some of the salads I make require cooking – like pasta or rice, so again, it’s wise to do that in advance. By having everything ready well before your guests turn up means you have more time to just enjoy the company and the food! Cross contamination of food can happen you handle and prepare raw and cooked food with the same utensils, or store them incorrectly, or allow raw/cooked foods to be in contact with each other. As the daughter of a Publican who grew up in pubs/restaurants, I’m very conscious of food handling procedures. Cross contamination is one of the biggest causes of food poisoning – the last thing you want to do is make people sick! So, follow these simple rules to ensure that that doesn’t happen. Use a different board for preparing meat/fish/vegetables. Similarly, use a different board for raw and cooked meat. If you don’t have lots of different chopping boards, ensure that they are well washed through between uses. That goes for other utensils like knives too. Always wash your hands between handling raw meat/fish and unwashed vegetables to prevent spreading germs from your hands to other foods/utensils. Cover food before placing it in the fridge. Raw meat always goes at the bottom so that it doesn’t drip on other foods. Root vegetables like potatoes and carrots often have soil traces left on them, so ensure you wash them thoroughly before preparing and cooking. If fruit and vegetables are going to be eaten raw, make sure that they are washed. Keep dishcloths/sponges clean and change them regularly. Ideally use paper towels to dry utensils rather than tea towels. And finally, make sure that any food that you cook on the grill is hot all the way through. Chicken juices should run clear when they’re cooked through. When we have a family barbecue there are a LOT of us – with three siblings, their partners, kids, my parents, plus the three of us it can be as many as 14 at one time! That means I have to be really organised with setting up the dining area. We don’t have a big outdoor dining table (unfortunately) so we set out a few of our smaller tables with chairs, and sometimes, even go picnic style on the grass! With a new garden design coming this year, I hope to get a nice big table to seat us all around. We put up a couple of sun umbrellas, to shade the eating area, we’ve even had a gazebo up – which is great for when the weather is warm, but it’s raining! Quite often for BBQs I get the throwaway paper plates out to save on washing up, and bundle up cutlery with napkins which are easy to grab. I put out various condiments and sauces, as well as serving utensils for salads and dips etc. I set up a drinks station with various drinks, glasses (plastic to save breakages) and ice. This is often in the kitchen so that the buzzy insects don’t hover around. If you’re barbecue is going to last into the night, don’t forget things like lighting and heating if it turns a bit chilly! Speaking of buzzy insects, I often light citronella candles to keep them at bay. I’m never really sure how well they work, but they’re supposed to, so I do! 6. Get Your Grill On! With everything set up – food, drinks, dining area, it’s time to get the barbecue going! I often watch a food show called ‘Barefoot Contessa’, the presenter, Ina Garten often cooks on the grill outside. 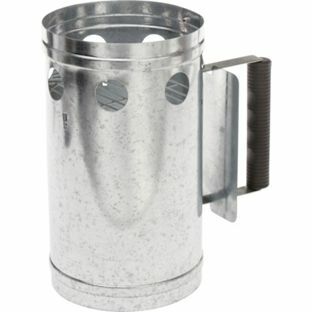 She uses a funnel thing to stack coals and get them heated evenly, and I’ve never seen them in the UK before – until I started browsing the Homebase website where I saw one – it’s totes on our list to buy for BBQ season!! They’re supposed to make lighting the coals a breeze, so it’s a must for us to buy. I’ve never used a gas barbecue, so I guess you just turn the gas on?? Make sure you have all the utensils that you need to hand – have separate ones for raw and cooked food, and make a space on the grill for vegetarian stuff (or another grill if you have one) so as not to mix meat and veggie food together. You can either cook to order, or cook everything off at once – the style of cooking and serving is purely a personal thing, so do whatever suits you best! If you happen to be the grill chef, make sure you grab yourself something to eat and drink – quite often you can be left out whilst everyone else is enjoying themselves! The coals may be dying down, but you can still toast marshmallows, or wrap up some bananas in foil and place them in the embers. Something fun and sweet at the end of a barbie is always good! We’ve washed the grill off and then cooked fruit on top – peaches, apples, pears and served them with some Greek yoghurt which gives a nice light, sweet end to the barbecued food. 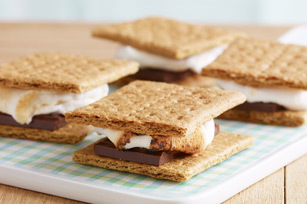 Or you could go all American and make s’mores – they are toasted marshmallows squished between Graham crackers with a cube of chocolate. You can’t buy Graham crackers here in the UK, but you could use a digestive or rich tea biscuit instead! We did buy some Graham crackers in Florida last year (they have a long shelf life, so going to be getting those out to make s’mores over the coals this year! Here are some of the barbecue get togethers I’ve thrown over the years, enjoy reading through them and trying out some of my recipes! It might be early in the year, but I have to know if you enjoy throwing a BBQ at home! What are your favourite barbecue dishes? What other tips would you add to my list? I’ll make sure to throw the best barbecue for the boys with your tips this coming weekend! Looking forward to more post on your website! Thanks for your lovely comments Ellis! We do love a barbecue in this house – looks like the weekend is shaping up for BBQ weather! Great post Michelle! 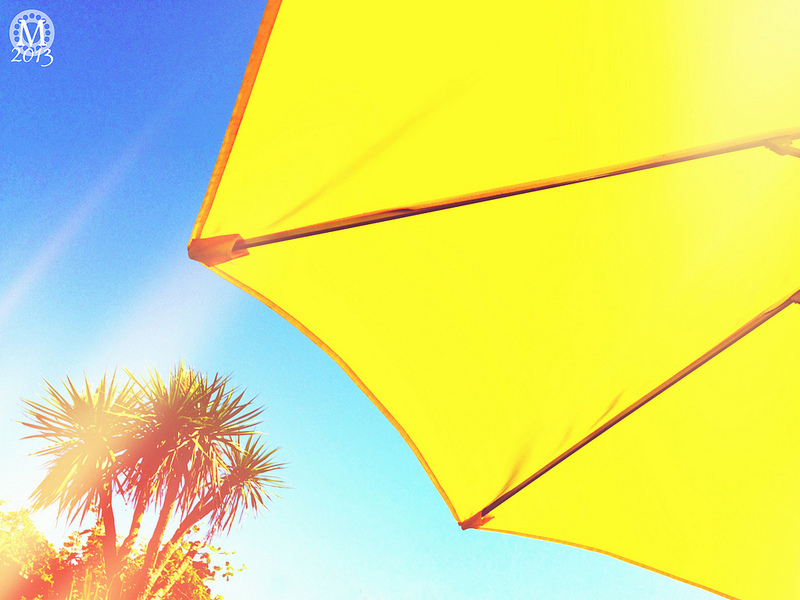 So many lovely tips :) I can’t wait for summer and all the bbq coming with it……as long as weather let us! I am hoping after all this horrid weather that we will have a blazing hot summer! That’s about right – I generally end up preparing way too much! It’s nearly springtime :D We love a BBQ so it’s never to early for us! 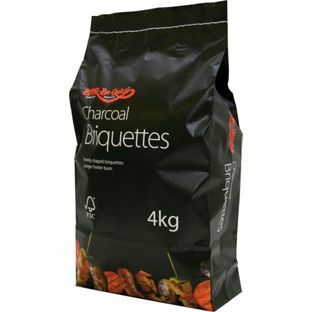 We had charcoal delivered today with our Ocado delivery. It was pouring with rain at the time and I got a very odd look, but we barbecue all year round and will be doing so on Saturday, and we have one of those charcoal starter funnel thingies too… they are very good! How awesome that you barbecue all year round! There’s no reason why not – just eat indoors (although, we’ve done that when the summer has been crappy) Enjoy your barbie on Saturday – the forecast predicts nicer weather – woohoo!! The weather perked up a bit today, so I can see why your thoughts might be heading towards summer. I love a good barbecue too and it’s nice to start dreaming about recipes etc. You can’t go wrong with bananas wrapped in foil. The sunshine through the window certainly helped – it’s shining again today – two days in a row? Awesome! 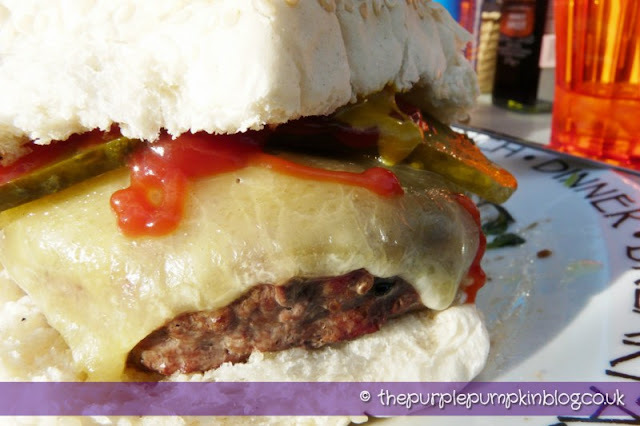 I love a good veggie bbq – roll on summer!! Our veggie bbq last year turned out well! I agree – roll on summer! My 3 year old constantly asks when can we get the BBQ out again :) Roll on summer…..
I’m not a BBQ fan as they are usually all charred meat, but your BBQ’s sound lovely! Oooh no, charred meat – blargh! Great tips. I always find BBQing more work and hassle, but I will try and follow your tips next time! I can see why it is a hassle, but a bit of prep and planning can make it a breeze! Ooh, enjoy your new house!! I am hoping we’ll have the garden sorted by summer, but if not, we’ll still bbq! not really a bbq fan, but there’s some good tips here! Roll on summer, but I have been known to bbq in snow. Love cooking outdoors, great tips! Oh I can’t wait for the summer and bbq’s! Some fab tips there especially the food ideas. I love barbecue ribs . I like your thinking regarding barbecues, shame I live in a flat though. We lived in a flat many years ago on the 1st floor – luckily we had a small balcony and we used one of those throwaway bbqs to cook some burgers! Probably not the best of ideas mind you. The sun was shining through the window as I was writing this post today – made me all happy happy joy joy – and the hope that spring will soon be sprung and that summer will soon follow! Can’t wait to organise the first barbecue of the year!! Oh it is far too cold for me to even consider a BBQ! Haha! I know, but I have to keep the faith – the sun will be back soon and I can go back into the garden! !